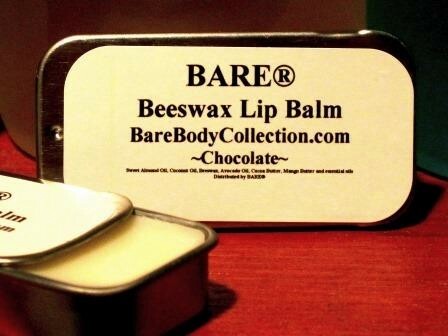 BARE Chocolate Beeswax Lip Balm for Lips goes on moist and keeps your lips feeling great. Our lip balms are great for chapped lips all Year long. With store bought lip balm you continually have to keep applying the lip balm - this is typically due to the fact that most lip balms are made with petroleum based products versus beeswax which keeps lips moisturized. The hard, waxy lip balm arrives in a simple tin, and when you open it the smell of hot chocolate wafts right up at you. If you're a chocolate lover (and who isn't? ), the smell alone will be enough to drive you wild (thanks to notes of Creamy Vanilla, Rich White Chocolate, Raw Sugar Cane and a hint of pepper). In case you're wondering why you'd put pepper in a perfectly delicious blend, it helps plump your lips and gives them a hint of your own, natural lip color (the lip balm is colorless). Another nice thing is that this beeswax lip balm lasts, to keep lips moisturized so you don't have ot apply it more often. A little bit goes a long way, thanks to Castor Seed Oil, Beeswax, Lauryl Laurate, Carnauba and Soy Wax. The only liability is that you'll find people wanting to ask you about it, and try it. Don't be mean...share!